Madrid is filled with beautiful buildings and stunning architecture. Some of them are well known and became symbols of the capital (everyone knows the “Schweppes Building on Gran Via) and some of them are little gems hidden within the city. In this month’s blog, the Mad4You Team wants you to discover the most fascinating buildings of Madrid. We hope you are ready to be amazed by, for some, the most beautiful architecture in the world! The Edificio Metrópolis is one of the most famous buildings in Madrid. This structure, decorated with numerous sculptures, is especially beautiful at night when it is spectacularly illuminated. Visiting Madrid at night is a must for all visitors! It was constructed in the early 1900 for the insurance company “La Union y el Fenix” and it is easily recognizable for its beautiful black dome and the statue of the winged goddess Victoria. 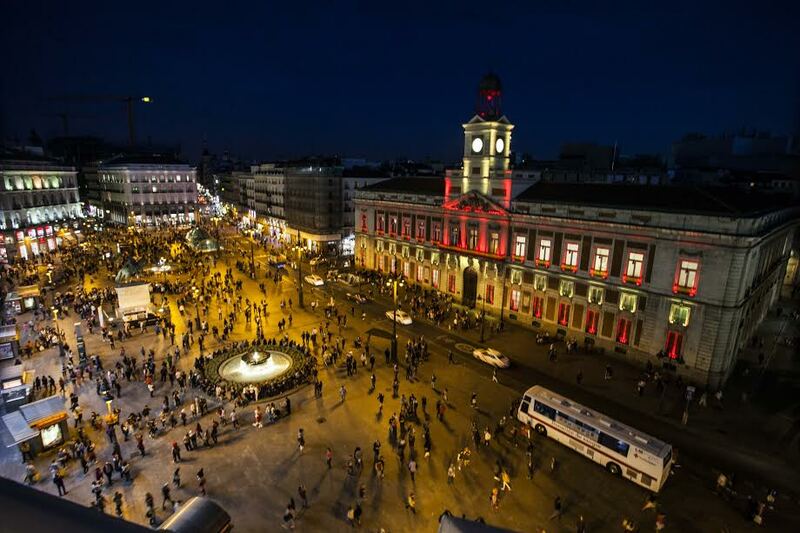 It was built by French architect Jacques Marquet at the Puerta del Sol as the central headquarters of the Spanish Post Office. At the moment it is destined to the functions of the Presidency of the Community of Madrid. The clock on the little tower marks the end of each year for the citizens of Spain with its twelve strikes of the bell on December 31st. The tradition consists of eating 12 grapes, one with each bell strike as wish of a year of prosperity! This is a true Spanish tradition. 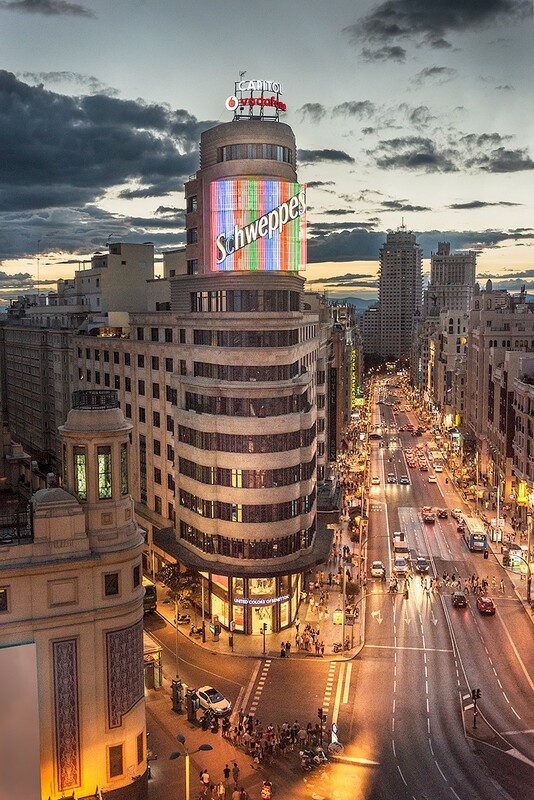 This is probably the most emblematic building of Madrid, located in the city´s main street Gran Via and just next to the super famous Plaza Callao. It was built between 1931 and 1933 and its style is Art Deco. In 2007 a full restoration was completed, which eliminated all the advertising on the façade except for the Schweppes sign and Vodafone sign on the rooftop. On April 3rd, 2018 this building was declared “Bien de Interés Cultural” which literally means “Good of Cultural Interest”. The Edificio Carrión is also known as the Edificio Capitol because it hosts the movie theater Cine Capitol. These four skyscrapers constitute a business center built on the former Real Madrid sports complex. The “Torre de Cristal” is 249 meters high and on the top floors you can access to a garden whereas the “Torre PwC” accommodate a 5 -star Hotel and a restaurant with a panoramic view of the city. The “Torre Espacio” is unique and singular for its design and its technology and the “Torre Cepsa” was designed by the prestigious British architect Norman Foster and since 2016 it belongs to Spanish business tycoon Amancio Ortega, who is the owner of Zara. This building is situated at the beautiful Cibeles Square and serves as the headquarters of the Mayor of Madrid, besides hosting the cultural center CentroCentro, at which exhibitions and concerts often take place. The responsible for this modernist design is the Spanish architect Antonio Palacios, which is also known for being the designer of the firsts lines and stations of the Metro of Madrid, and other famous buildings such as the Casino of Madrid or the Circulo de Bellas Artes. The central tower has a viewing point (mirador); a terrace from which visitors can view the city. For several months, the Palacio de Cibeles hosted the sign “Refugees Welcome” to show the support of the city for human rights and the willingness of the Spanish people to help during the recent humanitarian crisis. Mad4You Hostel is located very close to all the above-mentioned buildings. We are situated just five minutes walking distance from Gran Via and Plaza Callao and close to four of Madrid’s most important metro lines: Line 1 and 10 (Tribunal), Line 2 (Noviciado) and Line 4 (San Bernardo). For you it will be a breeze to go and explore those fascinating buildings from Mad4You Hostel by foot! Our Hostel reception is open 24 hours and our super staff is always ready to give you tips and advices for whatever you might need in Madrid!